I was inspired to create Politesse while planning my own wedding. 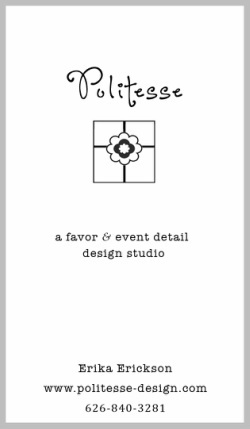 Using a sand dollar as the theme, I designed all of the event details to include it. I loved personalizing and perfecting the details. When it came time to select the favors, I was surprised by the lack of quality packaging choices. So, I decided to create my own. My hope is that Politesse will give you a unique opportunity to present your gifts in a way that adds beauty and originality to your event. civility, good breeding, polite attention, compliment, act of civility"